We pay tribute to the towering influence of British conductor Sir Colin Davis who passed away on Sunday, April 14, 2013. Davis was born in Weybridge, Surrey, the youngest of three sons among seven siblings, to Reginald George and Lillian Davis. 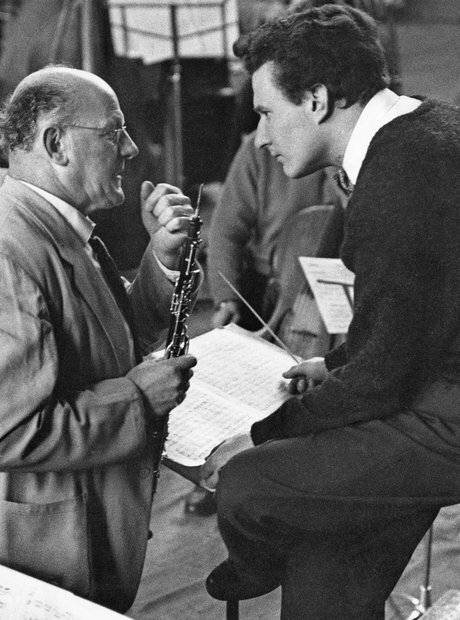 In this early photograph, he's accompanied by British oboist Léon Goossens. A former orchestral clarinettist, studying at the Royal College of Music in London, Davis worked his way steadily to prominence as a conductor of much versatility and dynamism, building up a world reputation in the music of Mozart and Berlioz. Davis first found wide acclaim when he stood in for an ill Otto Klemperer in a performance of Don Giovanni, at the Royal Festival Hall in 1959. Davis was for many years The Royal Opera’s music director, and was a former holder of major posts at the BBC Symphony, Boston Symphony and Bavarian Radio Symphony orchestras. Sir Colin was also an inspirational teacher, holding a post at the Landesgymnasium für Musik "Carl Maria von Weber" in Dresden, and was the International Chair of Orchestral Studies at the Royal Academy of Music, London. In 1960 he was appointed principal conductor at Sadler's Wells, London. English conductor Colin Davis rehearsing The Marriage of Figaro at Covent Garden, London, 19 November 1971. In 1995, Sir Colin became the LSO's Principal Conductor, holding the post longer than anyone else in the history of the orchestra. The legendary figure picked up a number of prestigious awards in his lifetime, including a Grammy in 2006 for Best Opera for his LSO Live recording and a Classic BRIT Award in 2008 for Best Male Artist. His influence stretched far and wide and was, aside from Sir Nevllie Marriner, the most recorded British conductor. Here, he accompanies Josep Caballé Domenech, the Spanish conductor and Sir Colin's protege. Classic FM's David Mellor was among the first to pay his respects to the conductor, describing the sad news as "the passing of a very major musician indeed". Photo credit: Alberto Venzago. The sad news of Sir Colin Davis' passing was announced on Sunday Evening, April 14, 2013. Photo credit: Alberto Venzago.